Heat oven to 400°F. Spray 9-inch glass pie plate with cooking spray. 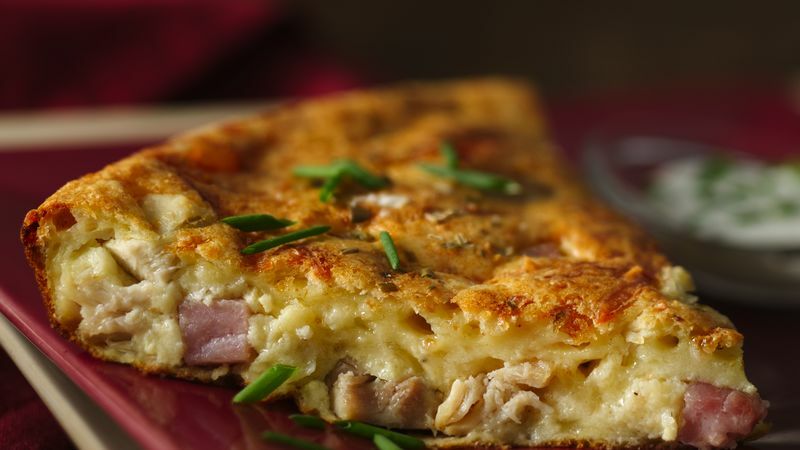 Layer chicken, ham and cheese in pie plate. In medium bowl, mix remaining ingredients with whisk or fork until blended. Pour over cheese in pie plate. Bake 30 to 35 minutes or until knife inserted in center comes out clean. Let stand 5 minutes before serving. If desired, serve with additional potato topper and fresh chives. Cordon bleu is a French dish combining chicken or veal with ham or prosciutto and Swiss or Gruyère cheese. In this easy recipe, those flavors are combined to produce a fantastic-tasting pie. Instead of chicken, simply use turkey.